Dynamic Programming ACM Workshop 24 August 2011. 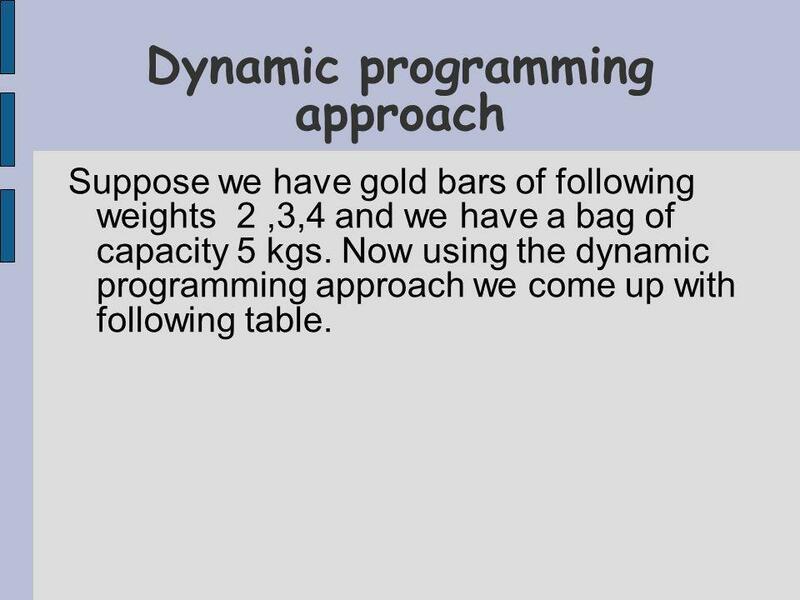 Dynamic Programming Dynamic Programming is a programming technique that dramatically reduces the runtime. 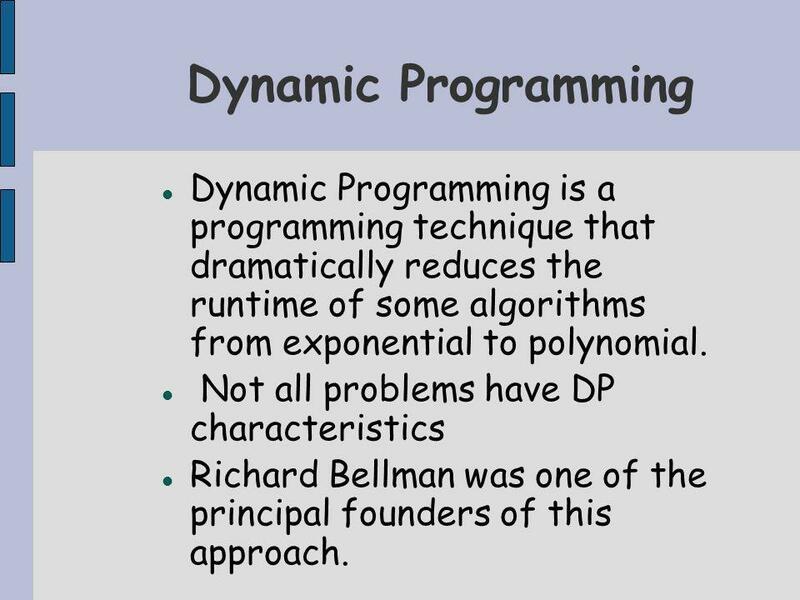 2 Dynamic Programming Dynamic Programming is a programming technique that dramatically reduces the runtime of some algorithms from exponential to polynomial. 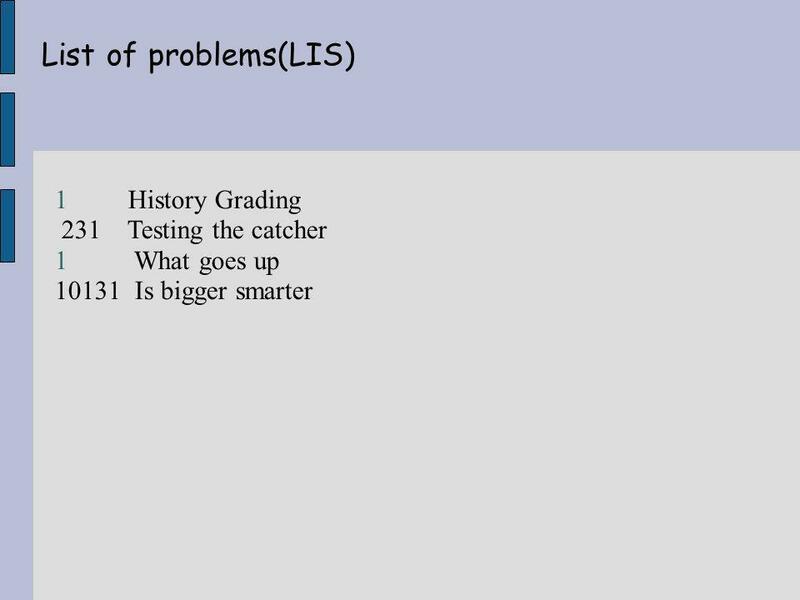 Not all problems have DP characteristics Richard Bellman was one of the principal founders of this approach. 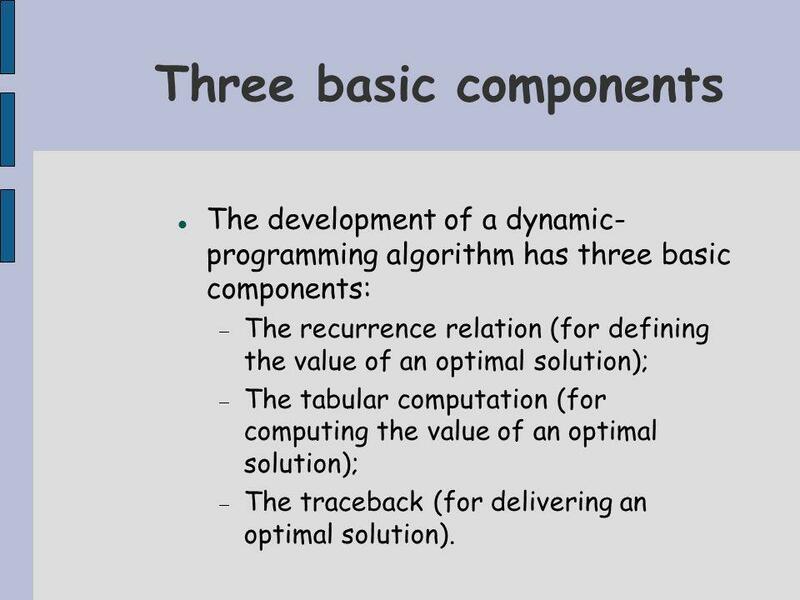 9 Three basic components The development of a dynamic- programming algorithm has three basic components: The recurrence relation (for defining the value of an optimal solution); The tabular computation (for computing the value of an optimal solution); The traceback (for delivering an optimal solution). 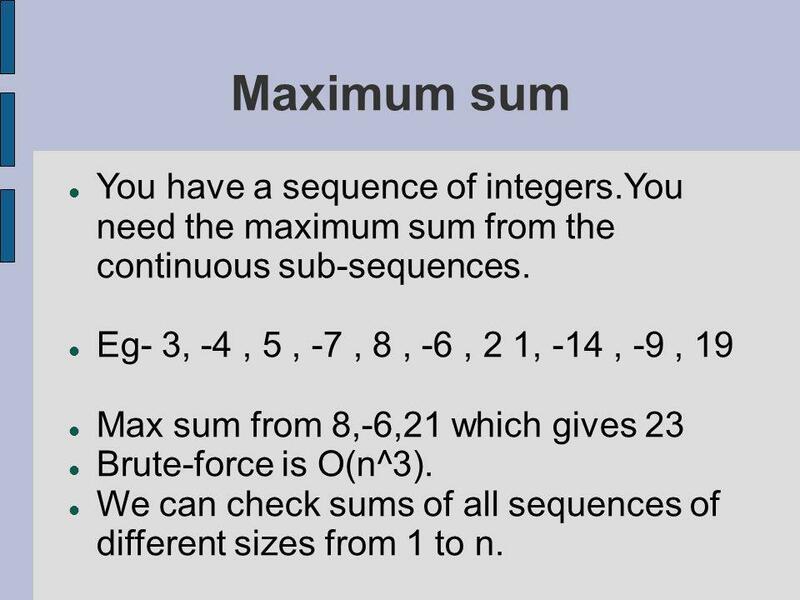 10 Maximum sum You have a sequence of integers.You need the maximum sum from the continuous sub-sequences. 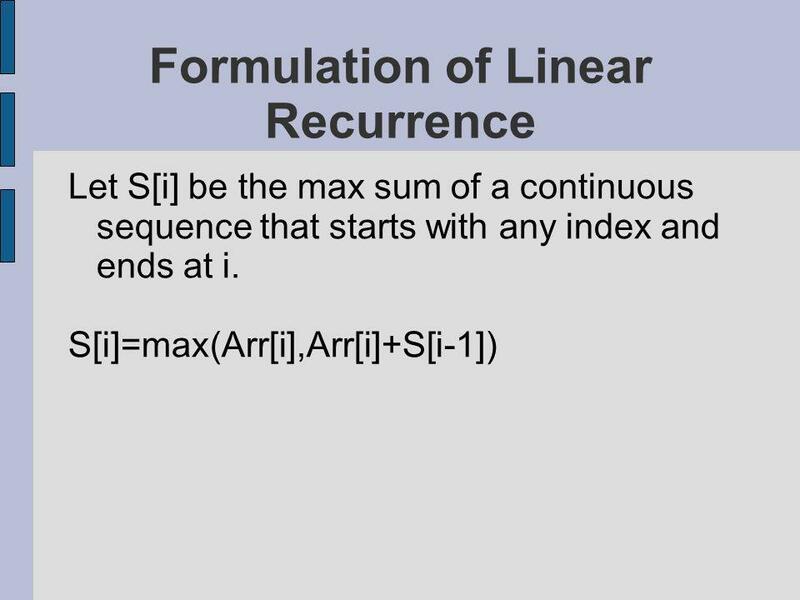 Eg- 3, -4, 5, -7, 8, -6, 2 1, -14, -9, 19 Max sum from 8,-6,21 which gives 23 Brute-force is O(n^3). 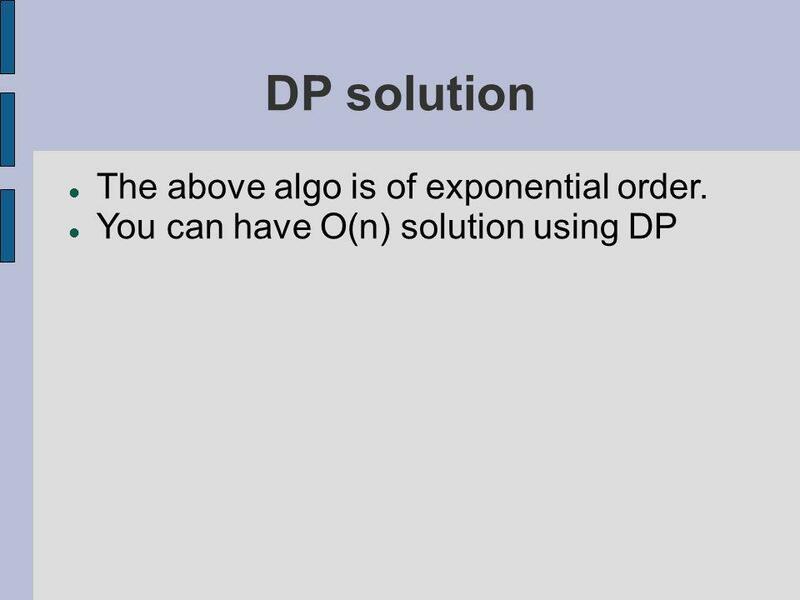 We can check sums of all sequences of different sizes from 1 to n.
11 Solving Problem is no problem. 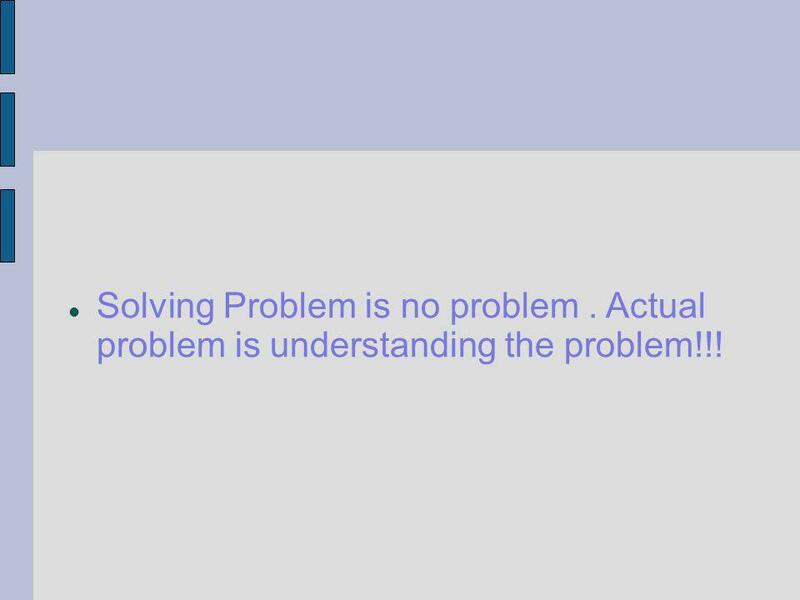 Actual problem is understanding the problem!!! 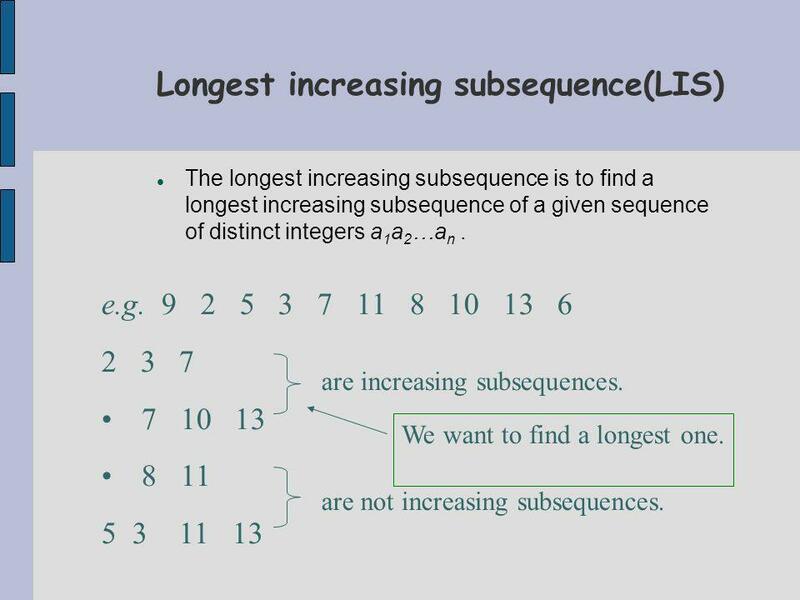 14 Longest increasing subsequence(LIS) The longest increasing subsequence is to find a longest increasing subsequence of a given sequence of distinct integers a 1 a 2 …a n. e.g. 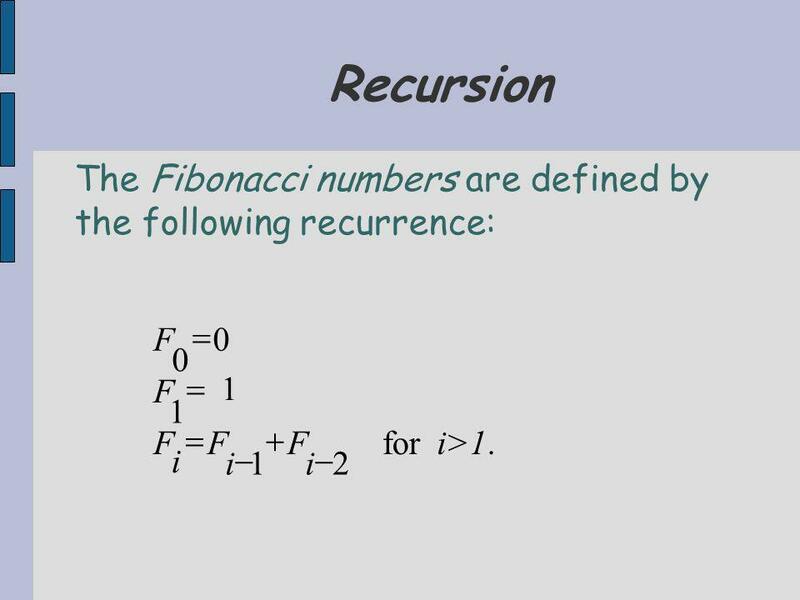 9 2 5 3 7 11 8 10 13 6 2 3 7 7 10 13 8 11 5 3 11 13 are increasing subsequences. are not increasing subsequences. We want to find a longest one. 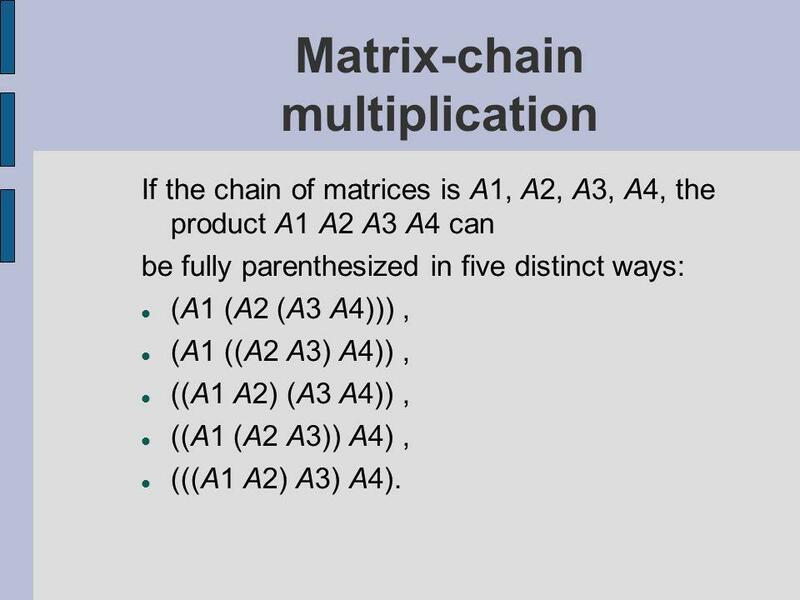 19 Matrix-chain multiplication If the chain of matrices is A1, A2, A3, A4, the product A1 A2 A3 A4 can be fully parenthesized in five distinct ways: (A1 (A2 (A3 A4))), (A1 ((A2 A3) A4)), ((A1 A2) (A3 A4)), ((A1 (A2 A3)) A4), (((A1 A2) A3) A4). 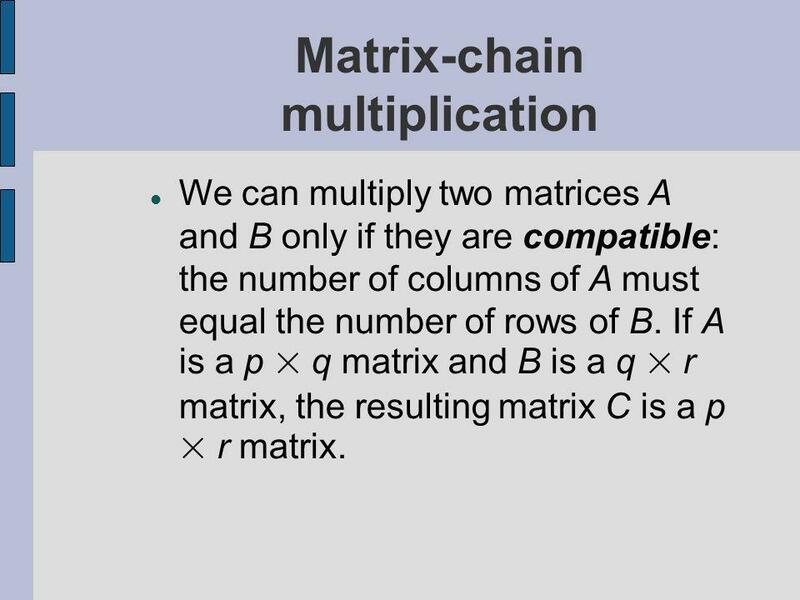 20 Matrix-chain multiplication We can multiply two matrices A and B only if they are compatible: the number of columns of A must equal the number of rows of B. 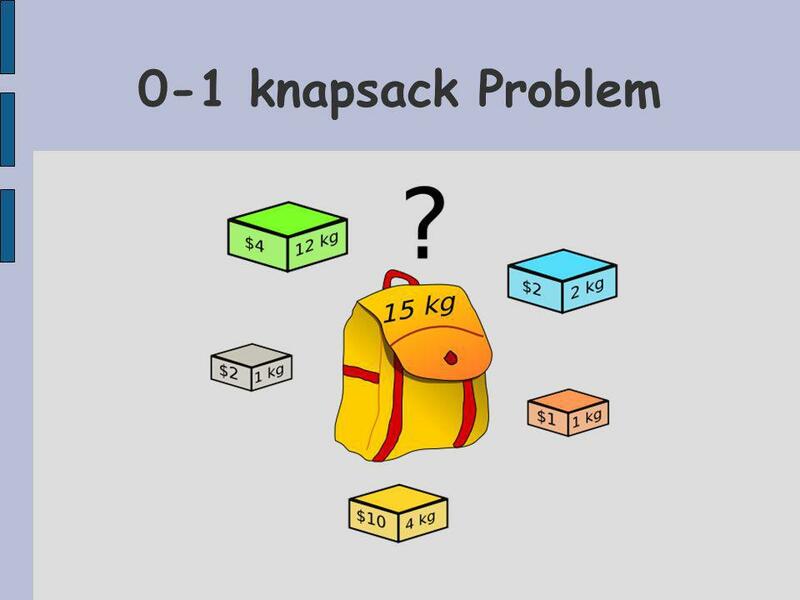 If A is a p × q matrix and B is a q × r matrix, the resulting matrix C is a p × r matrix. 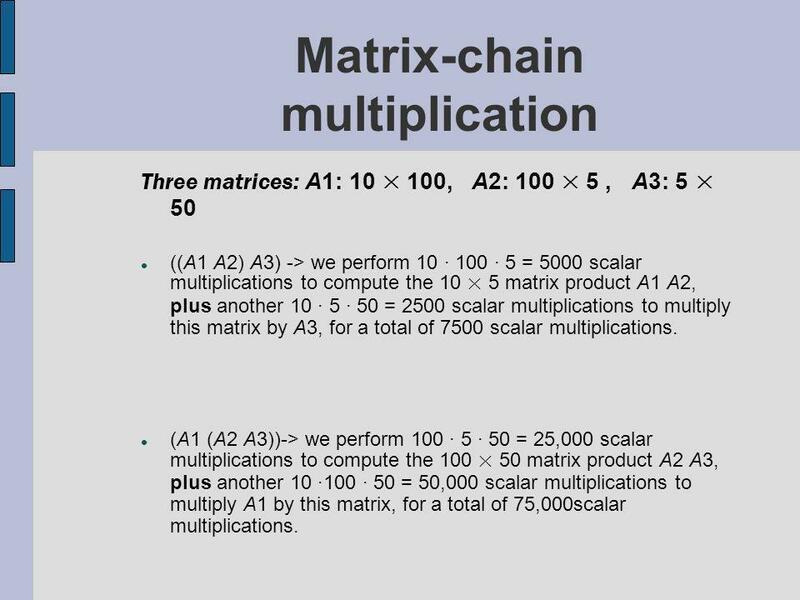 21 Matrix-chain multiplication Three matrices: A1: 10 × 100, A2: 100 × 5, A3: 5 × 50 ((A1 A2) A3) -> we perform 10 · 100 · 5 = 5000 scalar multiplications to compute the 10 × 5 matrix product A1 A2, plus another 10 · 5 · 50 = 2500 scalar multiplications to multiply this matrix by A3, for a total of 7500 scalar multiplications. 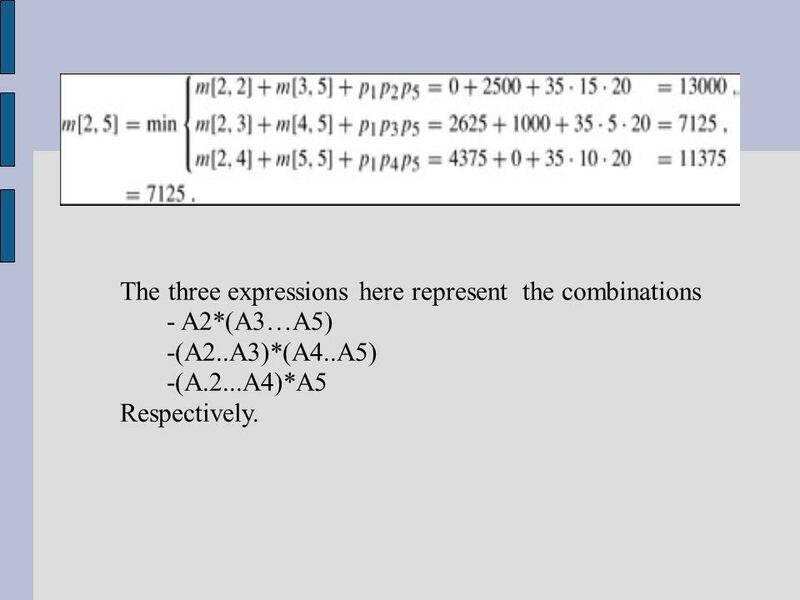 (A1 (A2 A3))-> we perform 100 · 5 · 50 = 25,000 scalar multiplications to compute the 100 × 50 matrix product A2 A3, plus another 10 ·100 · 50 = 50,000 scalar multiplications to multiply A1 by this matrix, for a total of 75,000scalar multiplications. 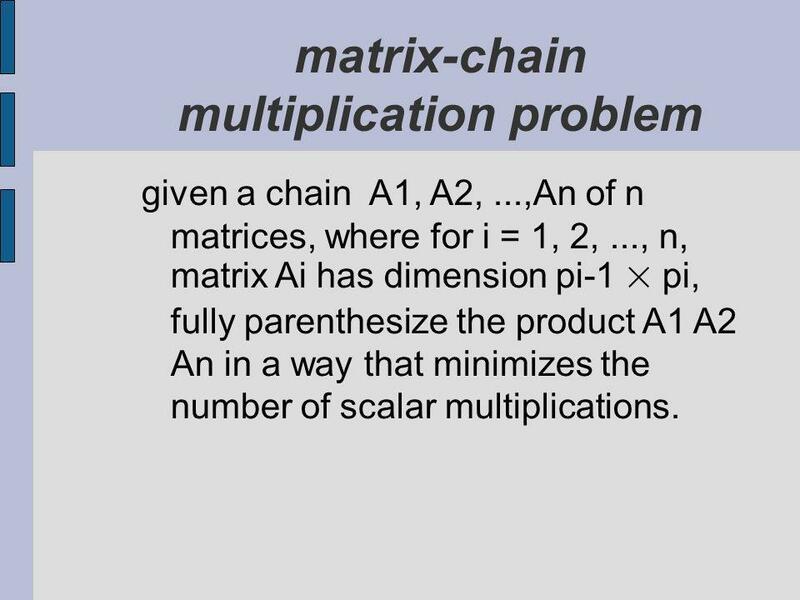 22 matrix-chain multiplication problem given a chain A1, A2,...,An of n matrices, where for i = 1, 2,..., n, matrix Ai has dimension pi-1 × pi, fully parenthesize the product A1 A2 An in a way that minimizes the number of scalar multiplications. 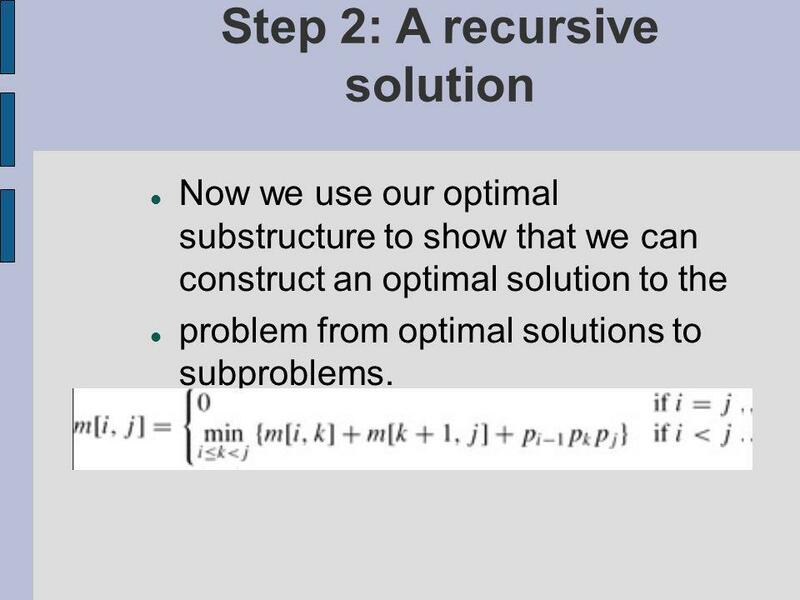 23 Step 2: A recursive solution Now we use our optimal substructure to show that we can construct an optimal solution to the problem from optimal solutions to subproblems. 24 The three expressions here represent the combinations - A2*(A3…A5) -(A2..A3)*(A4..A5) -(A.2...A4)*A5 Respectively. 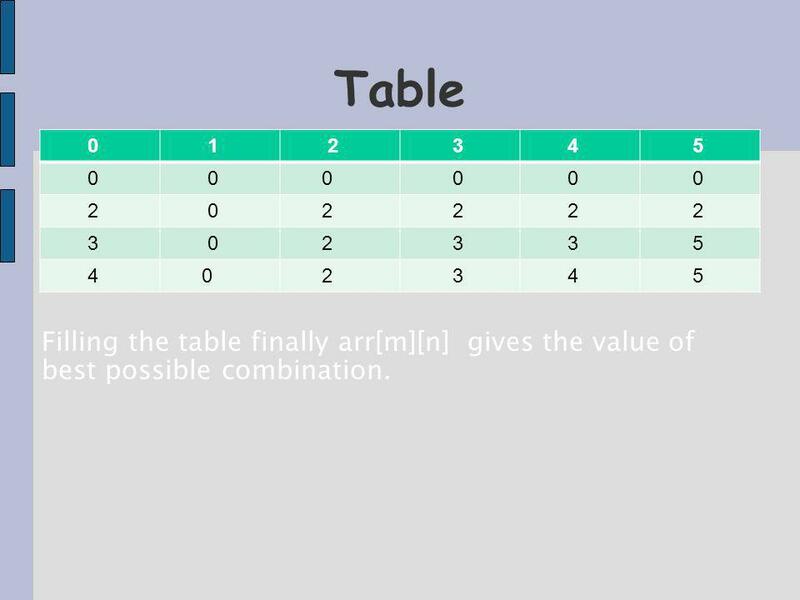 31 Table 0 1 2 3 4 5 0 0 0 0 0 0 2 0 2 2 2 2 3 0 2 3 3 5 4 0 2 3 4 5 Filling the table finally arr[m][n] gives the value of best possible combination. 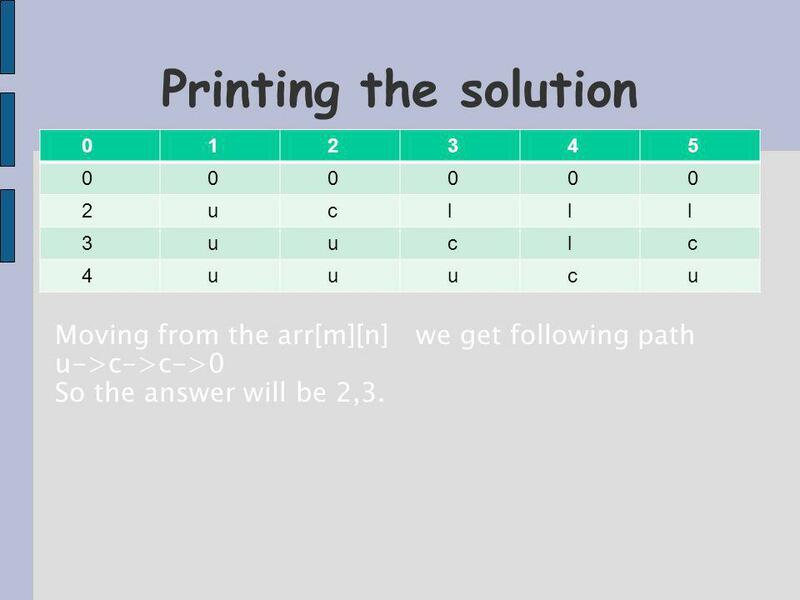 32 0 1 2 3 4 5 0 0 0 0 0 0 2 u c l l l 3 u u c l c 4 u u u c u Printing the solution Moving from the arr[m][n] we get following path u->c->c->0 So the answer will be 2,3. 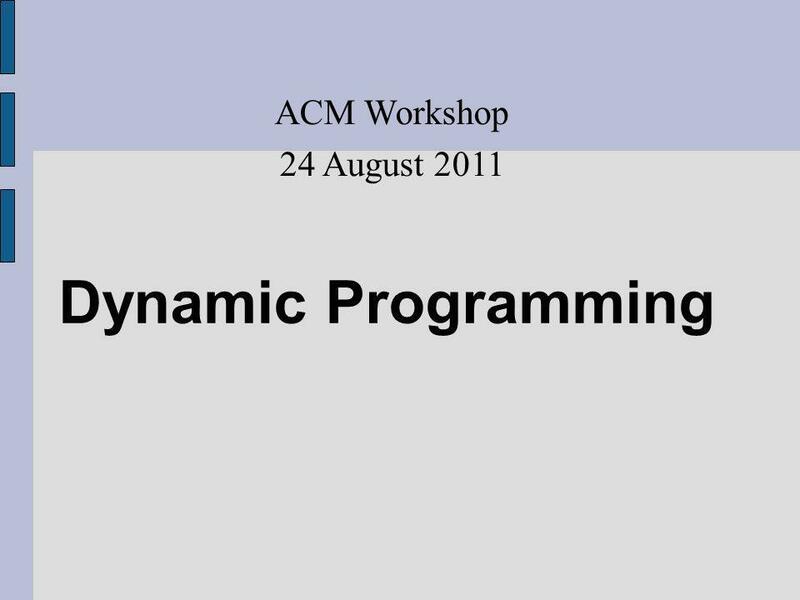 Download ppt "Dynamic Programming ACM Workshop 24 August 2011. 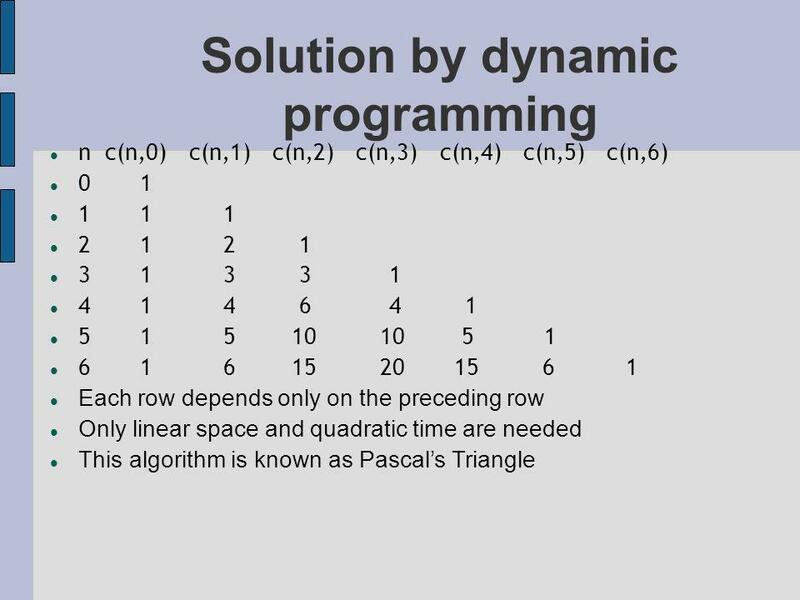 Dynamic Programming Dynamic Programming is a programming technique that dramatically reduces the runtime." £1 Million £500,000 £250,000 £125,000 £64,000 £32,000 £16,000 £8,000 £4,000 £2,000 £1,000 £500 £300 £200 £100 Who Wants. 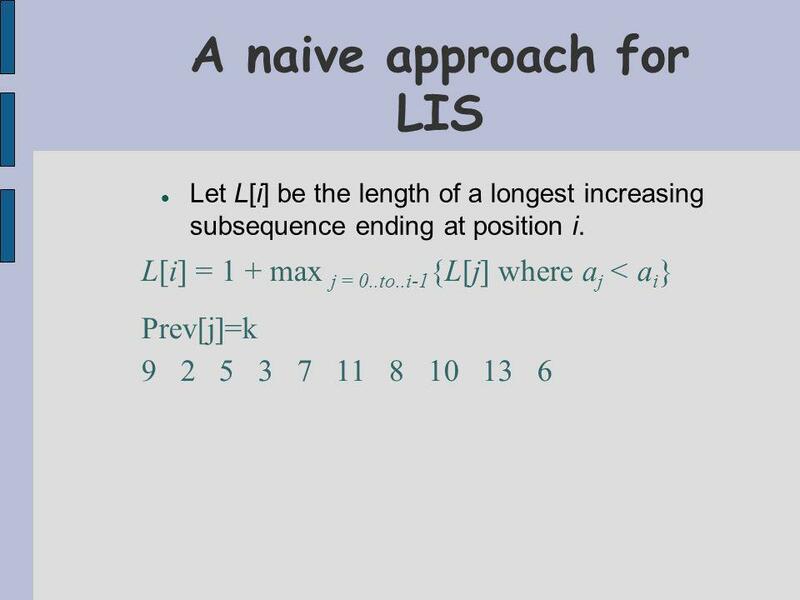 Dynamic Programming Introduction Prof. Muhammad Saeed. 12-Apr-15 Analysis of Algorithms. 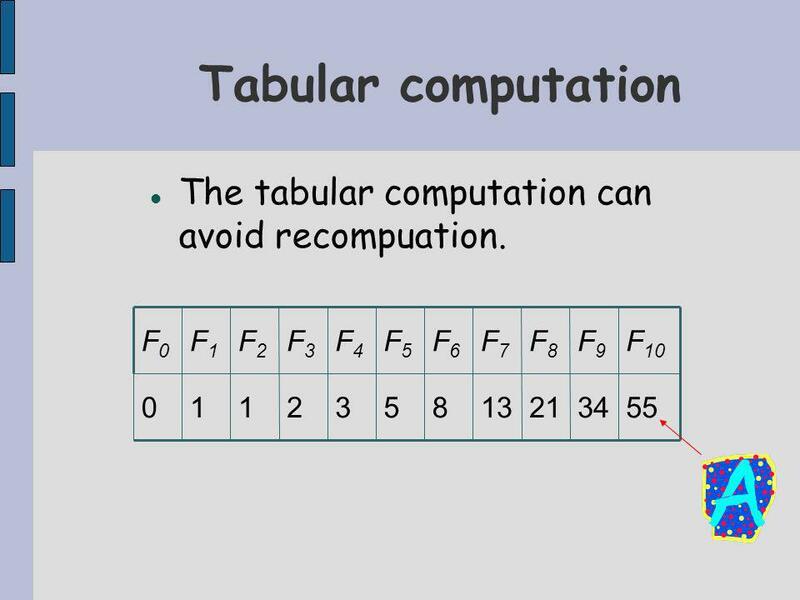 2 Time and space To analyze an algorithm means: developing a formula for predicting how fast an algorithm is, based. Multiplying Matrices Two matrices, A with (p x q) matrix and B with (q x r) matrix, can be multiplied to get C with dimensions p x r, using scalar multiplications. 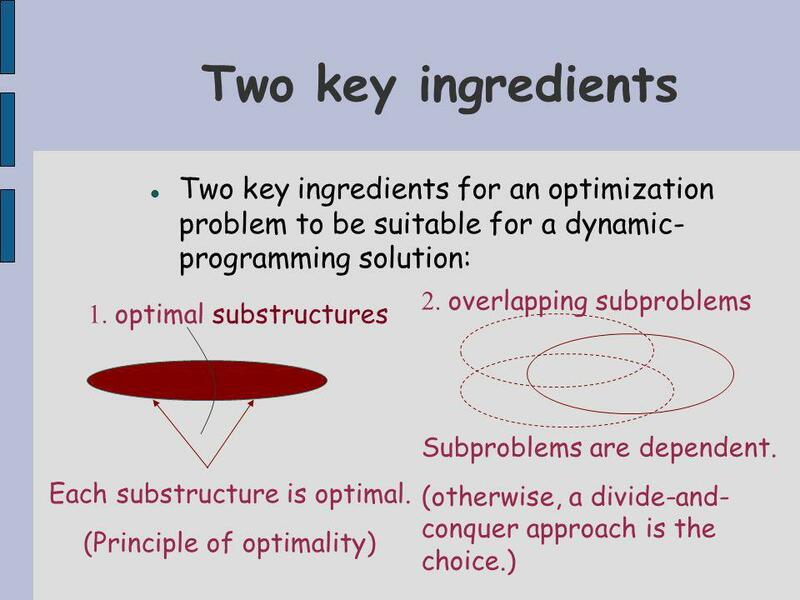 Algorithm Design Methodologies Divide & Conquer Dynamic Programming Backtracking. 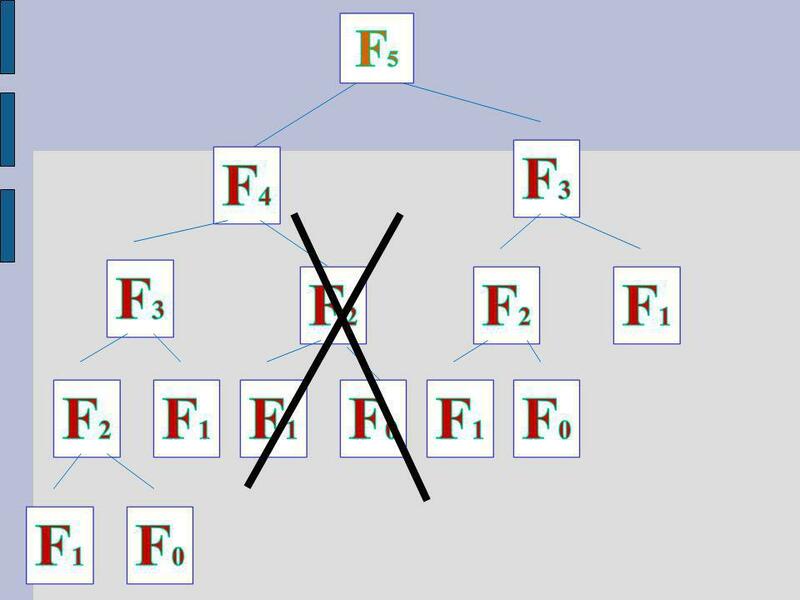 Dynamic Programming An algorithm design paradigm like divide-and-conquer “Programming”: A tabular method (not writing computer code) Divide-and-Conquer. 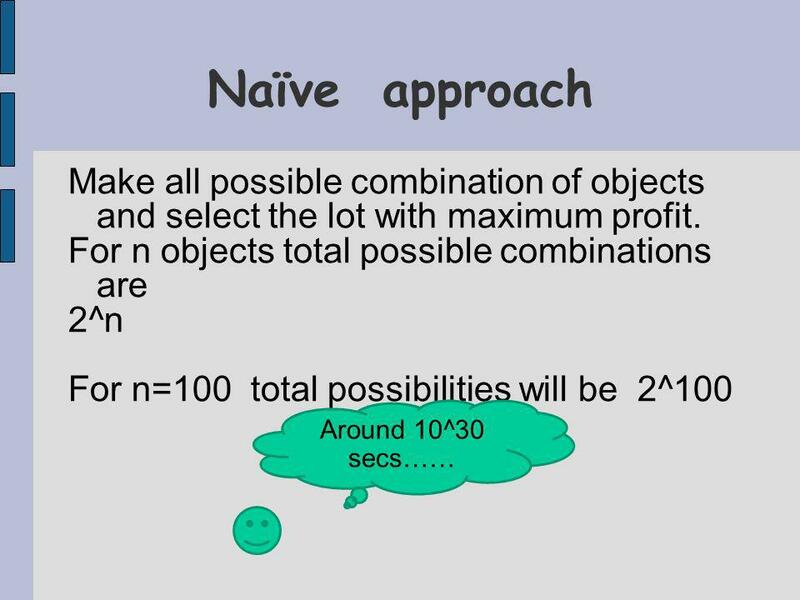 COMP8620 Lecture 8 Dynamic Programming. 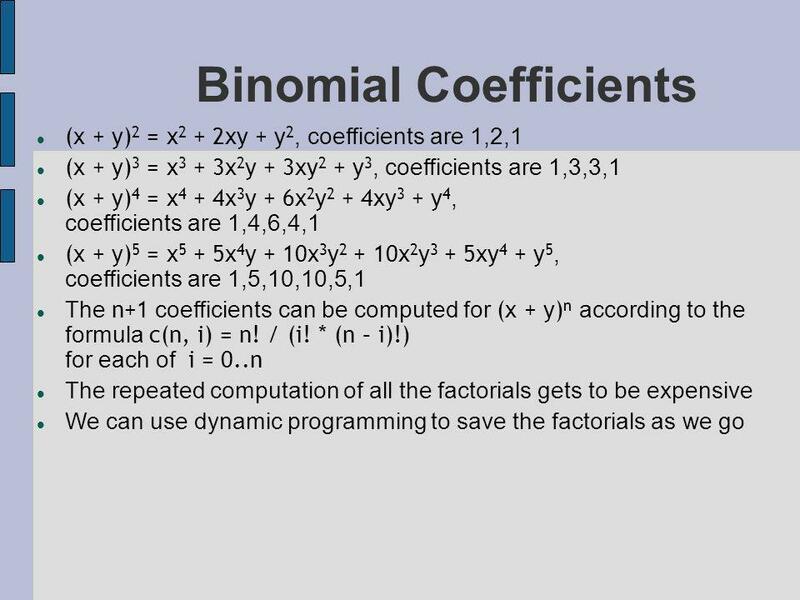 15-May-15 Dynamic Programming. 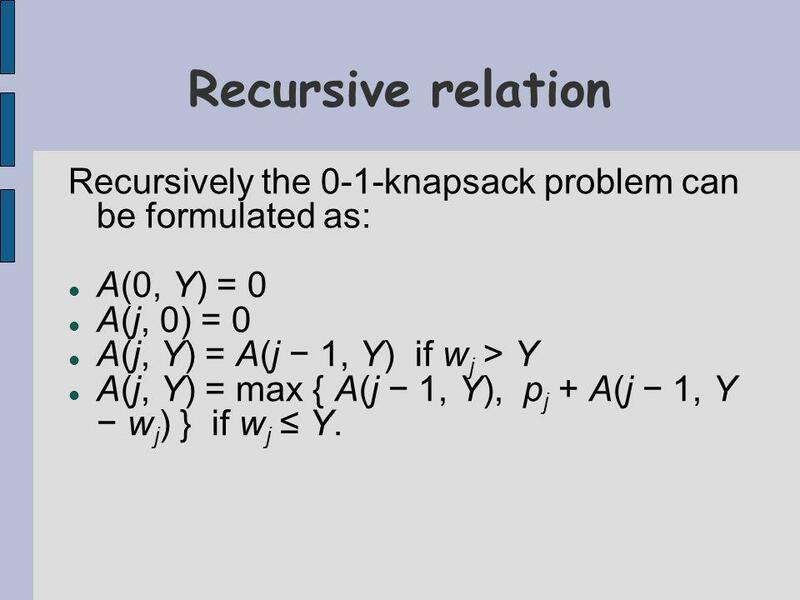 2 Algorithm types Algorithm types we will consider include: Simple recursive algorithms Backtracking algorithms Divide. 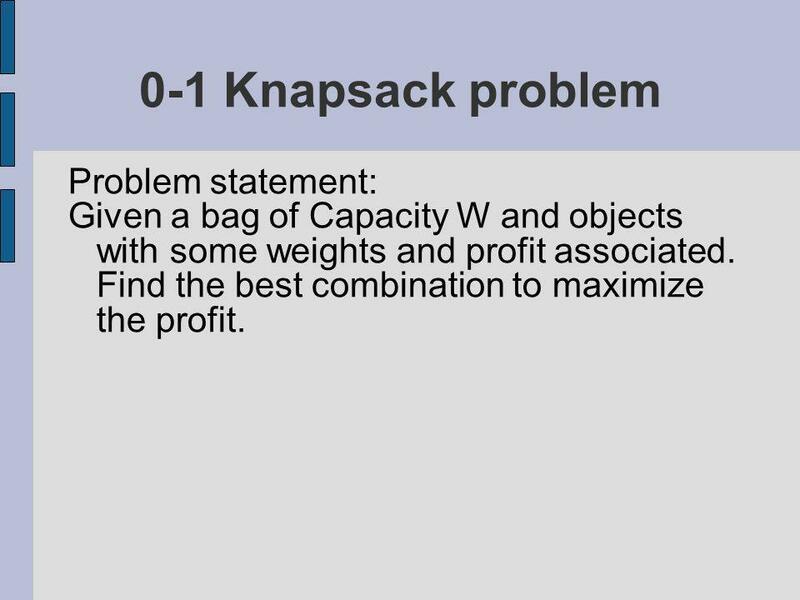 16-May-15 Dynamic Programming. 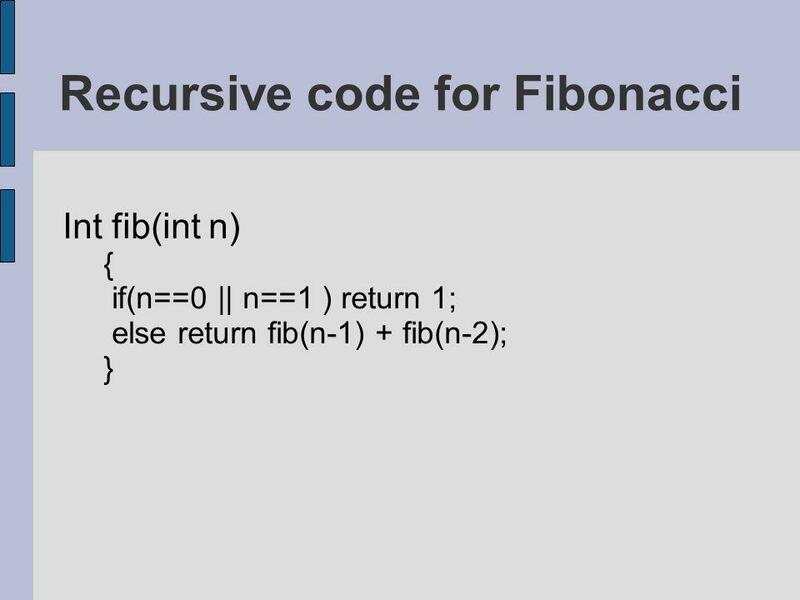 2 Algorithm types Algorithm types we will consider include: Simple recursive algorithms Backtracking algorithms Divide. 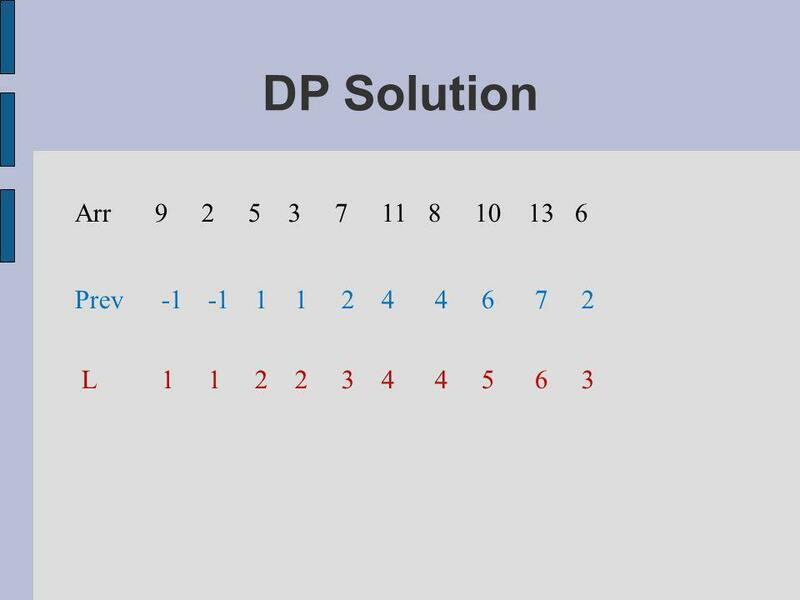 Dynamic Programming Dynamic Programming is a general algorithm design technique for solving problems defined by recurrences with overlapping subproblems.